There’s that mistaken belief heaven is a one-way ticket. Truth is, it’s not. Only hell is. In Christian theology hell is a one-way ticket. There’s no return flight from that dimension. But heaven is not a one-way ticket. The Bible says the righteous are coming back to earth after a relatively brief stay in heaven, albeit as citizens of a new earth: “Then I saw a new heaven and a new earth, for the old heaven and the old earth had disappeared. And the sea was also gone. And I saw the holy city, the New Jerusalem, coming down from God out of heaven like a bride beautifully dressed for her husband. I heard a loud shout from the throne, saying, “Look, God’s home is now among his people! He will live with them, and they will be his people. God himself will be with them.” Revelation 21:1-3 NLT. The passage suggests God will have a base on earth and domicile with mankind. He’ll live with humanity. Now, no one knows when these events will take place. Timelines are typically messed up in Revelation. The concept of time in Revelation is closer to the fundamental understanding of time in Physics – more like what you’ll read in a Carlo Rovelli book. But it seems pretty certain we’re not going to stay in heaven for ever. We’re going to occupy a new earth. At some point in history we’re going to be talking about New Earth same way we talk about New York. There is Old York. Based on Revelation therefore it would be fair to see heaven as a transit camp. Atypical of God however he builds an impressive transit camp. It’s made up of mansions. (God goes for maximal excellence in everything). It’s what Jesus was talking about when he said, “In my Father’s house are many mansions: if it were not so, I would have told you. I go to prepare a place for you.” John 14:2 KJV. Many translations refer to those mansions as rooms in God’s house. That gives us the sense of scale. God doesn’t do things in moderation. Grandeur is native to God. Of course the predominant theological understanding is that Christians will permanently stay in Heaven. But that’s an un-researched position. The validity of a theology should not be determined by how long it’s been held but the authority of God’s word. Neither should the validity of a theology be based on populism. A theology is not valid because many people subscribe to it, it’s whether it’s backed by God’s word. And so when it comes to the question of Christians staying permanently in heaven the critical question is, what does God’s word say? It would seem therefore that we’re mere tourists in heaven; which of course begs the question, what are the tourist sites in heaven? It’s like going to a new country. There’ll be places you’ve heard of, tourist sites people have spoken about. You’ll naturally want to explore those places. If you’re going to London for example you’ll probably want to see Buckingham Palace, see the change of guards, perchance catch the Queen on her way to the market. (Yeah right!) You’d probably want to go to Hyde Park, visit The British Museum, The London Eye, Tower of London, buy something on Oxford Street… I’d also recommend the Tate Modern. It will therefore be quite natural to want to visit those tourist sites mentioned in the Bible when we get to Heaven. There are quite a few. God has a tourist map. Of course, some believe all we’ll do in heaven is worship God. After all there are those four creatures in front of God’s throne telling God he’s special every moment of their existence: “Day after day and night after night they keep on saying, “Holy, holy, holy is the Lord God, the Almighty – the one who always was, who is, and who is still to come.” Revelation 4:8 NLT. “Holy, Holy, Holy” just means God is thrice set apart, unique, and special. Holiness is about being set apart. It’s how we got the word “sanctification.” The Greek word is hagios. Means different. Those beasts we’re told give “glory and honour and thanks to him that sat on the throne, who lives for ever and ever.” Revelation 4:9 KJV. They have a synchronised program with the Fab 24 – the Twenty and Four Elders: “Whenever the living beings give glory and honour and thanks to the one sitting on the throne (the one who lives forever and ever), the twenty-four elders fall down and worship the one sitting on the throne (the one who lives forever and ever).” Revelation 4:9-10 NLT. Yes, there’ll be worship in heaven and all that but we must not forget heaven is a political expression. It’s under a government. That it’s a political domain is why Satan led an insurrection. Note that Satan is described in scriptures as a corrupt public servant who traded favours while in heaven like a Mafia don: “Through the abundance of your commerce you were internally filled with lawlessness and violence, and you sinned.” Ezekiel 28:16 AMP. “You profaned your sanctuaries by the great quantity of your sins and the enormity of your guilt, by the unrighteousness of your trade.” Ezekiel 28:18 AMP. So there’s a whole lot going on in heaven, just like in any political environment. Heaven is not a church, it’s a political expression. There are public servants performing various functions. It has a standing army. That’s the “host of Heaven” we often talk about. Luke 2:13. 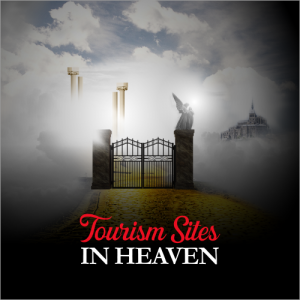 What are the tourist attractions in heaven? What places are must-see, what places can we look forward to? Truth is, the narrative of scriptures is more like, “Wait till you get here!” Not much is given away. We don’t know much about the geography of heaven. We don’t have much of a map. And heaven is vast! It’s actually a dimension. A clue to the vastness of heaven lies in the fact it holds a humongous population of humans, possibly a hundred billion or more. And that’s just humans. Think of all the righteous dead over generations and over millennia. Heaven holds them all, conveniently. That’s a LOT of people! And that’s the past not the future dead. Heaven has to be large enough to hold successive generations of humans very, very, very far into the future. It can’t be “full”. It’s not a local cemetery. The visa is always open. Romans 10:9. There’s an angel population in heaven and they’re many. The angels who circle the throne of God alone are a hundred million. Revelation 5:11. Hebrews 12:22 describes angels as “innumerable.” Trillions? To appreciate the census figure of the angelic population in heaven consider that for every earthling born there’s a guardian angel. Matthew 18:10. Going by current population of earth we should assume there are at least 7.7 billion guardian angels dedicated to humans. Matthew 18:10. Then there are those angels with ministerial portfolios. Some are in charge of natural resources. There’s an angel in charge of water resources on earth for instance. Revelation 16:5. We don’t know how many such ministerial portfolios exist, or the size of the civil service departments those angels head. Who knows, maybe there’s an angel in charge of methane rivers on Saturn, just as there’s an angel in charge of earth’s waters. Humans in essence are immigrants to Heaven. Heaven has a native population of creatures and angels. We know at least two tribes of angels – Cherubims and Seraphims. The first generation of humans in heaven were probably a spectacle. Some must have arrived with their reputation preceding them. Think of that thief on the right hand of Jesus. Luke 23:33-43. He’ll be instantly popular. No human qualifies for the residency programme in heaven. When the Bible says salvation is by grace it’s the underscoring of our non-qualification. Ephesians 2:8-9. Those who imagine they’d make heaven on their own qualification don’t realise the difference between morality and righteousness. God’s visa program is based on imputed righteousness not human morality. Morality is a human society regulatory protocol. It’s not the basis of salvation. Imputed righteousness is. We are donees of grace – unmerited favour. Ephesians 2:8-9. The reason some people imagine their morality will qualify them for heaven is because they do not realise the full ambit of God’s jurisdiction. They think God judges only actions – what lawyers call actus reus. But God judges the heart – our thoughts, motivations and intent, not just actions. God judges what lawyers call mens rea – our mental state. In God’s criminal code both action and imagination create liability. Matthew 5:28. And the thoughts of man are continually evil. “We all arrive at your doorstep sooner or later, loaded with guilt, our sins too much for us.” Psalm 65:2 MSG. There are eight tourist attractions in heaven that are mentioned in the Bible. They are The Throne Room, The Temple, The Altar, The Great White Throne, The Holy Mountain of God, The River of Water of Life, The Great Street and Mount of Assembly. Let’s start with the Throne Room. Of course you know it’s not a room in that sense. That’s God’s palace. And it’s not small. It’s a domain. His throne is surrounded by thrones: “A throne stood in heaven, with One seated on the throne. Twenty-four other thrones surrounded the throne; and seated on these thrones were twenty-four elders dressed in white clothing, with crowns of gold on their heads. From the throne came flashes of lightning and rumbling sounds and peals of thunder. Seven lamps of fire were burning in front of the throne, which are the seven Spirits of God, and in front of the throne there was something like a sea or large expanse of glass, like the clearest crystal. In the centre and around the throne were four living creatures who were full of eyes in front and behind, seeing everything and knowing everything that is around them.” Revelation 4:2, 4-6 AMP. The next tourist attraction is the Temple: “After that, another angel came from the Temple in heaven…” Revelation 14:17 NLT. Next you have the Altar. It’s in the temple. That’s where prayers are processed: “Then another angel with a gold incense burner came and stood at the altar and a great amount of incense was given to him to mix with the prayers of God’s people as an offering on the gold altar before the throne. The smoke of the incense, mixed with the prayers of God’s holy people, ascended up to God from the altar where the angel had poured them out.” Revelation 8:3-4 NLT. Next we have the Great White Throne. That’s God’s famous judgment seat: “And I saw a great white throne and the one sitting on it. The earth and sky fled from his presence, but they found no place to hide.” Revelation 20:11 NLT. Think of it as the Supreme Court. Next is the Holy Mountain. If you’re a volcanologist you’ll be interested in this attraction. It exhibits volcanic phenomena. Satan had access to it: “I ordained and anointed you as the mighty angelic guardian. You had access to the holy mountain of God and walked among the stones of fire.” Ezekiel 28:14 NLT. There’s also the River of Water of Life flowing down Great Street. Kind of like Central Park in the middle of Broad Street: “Then the angel showed me a river with the water of life, clear as crystal, flowing from the throne of God and of the Lamb. It flowed down the centre of the main street.” Revelation 22:1. Then there’s the Mount of Assembly at Zaphon. That was the pinnacle of Satan’s ambition: “I will climb up to the sky. Above the stars of El I will set up my throne. I will rule on the mountain of assembly on the remote slopes of Zaphon.” Isaiah 14:13. There are supplementary sites to see as well. Of course there are those mansions Jesus spoke about. John 14:2. Would be nice to see the architectural styles and different layouts. Are they all the same? There must be vineyards in heaven as well. Jesus said, “I tell you, from now on I will not drink of this fruit of the vine until that day when I drink it new with you in my Father’s kingdom.” Matthew 26:29 NET. Perhaps we’ll be able to do a virtual reality tour of the New Jerusalem like John did. From all accounts it’s something else: “The wall was jasper, the colour of Glory, and the City was pure gold, translucent as glass. The foundations of the City walls were garnished with every precious gem imaginable.” Revelation 21:18. “The twelve gates were twelve pearls, each gate a single pearl. The main street of the City was pure gold, translucent as glass.” Revelation 21:21. It’s almost like visiting Universal Studios theme park in Orlando, Florida. This virtual reality tour has to be a star attraction. This entry was posted in Cogitations, Illuminare and tagged Heaven, tourism. Bookmark the permalink.